I would like to introduce you to my FIRST quilt! If this was a credit card commercial, I would list out the price of all the items and end with “Seeing this project through and not giving into the desire to throw it in the trash and set it on fire, Priceless.” No, the quilt pattern wasn’t that hard. Everything turned out pretty nicely until… I decided to hand quilt. First let me say I love hand quilting. I think it is beautiful and is a lot of fun to do. 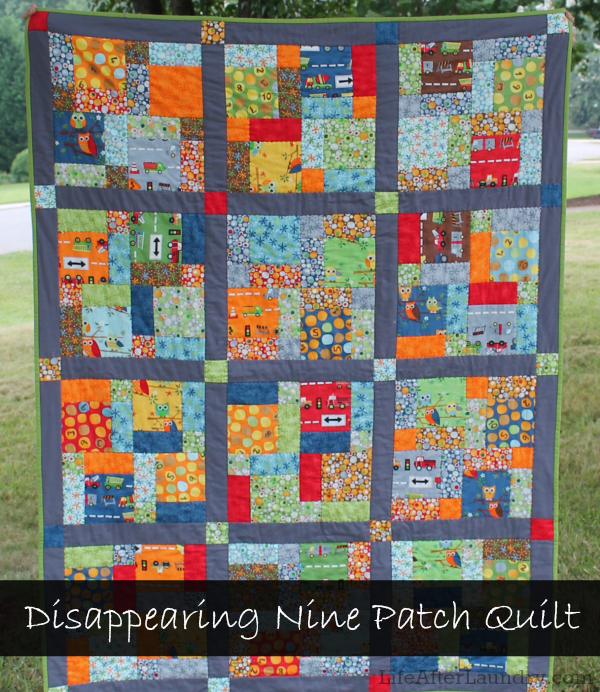 But, your first hand quilting project shouldn’t be a twin size quilt. What was I thinking? “Oh, a large project is a wonderful idea, by the end of it I will be a hand quilting pro!” Well, not quite, as in you are going to curse the day you ever started this quilt. By the end I was so ready to have this project done, that the last thing I cared about were perfect stitches. Would I ever hand quilt again? Absolutely! 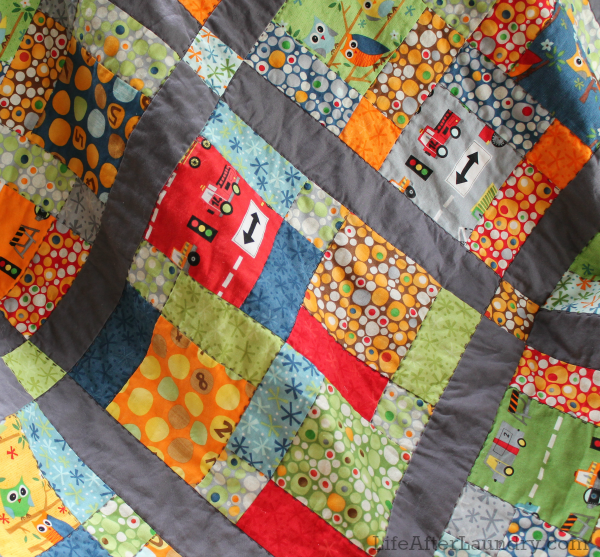 But, I think hand quilting makes a good addition to machine quilting. I could have saved myself a lot of blood, (yes, I did poke my finger a couple times) sweat and tears if I would have done some quick straight line quilting down the borders of this quilt and then focused on hand stitching the blocks. I have to say once I finally got up the strength and courage to finally finish this I couldn’t be more proud. I love it! It makes me so happy to tuck my son in every night and see the quilt I made for him, keeping him warm. All I can say is WOW. I can’t imagine quilting an entire blanket by hand. That had to take forever! Your stitches look PERFECT. That’s quite a talent. 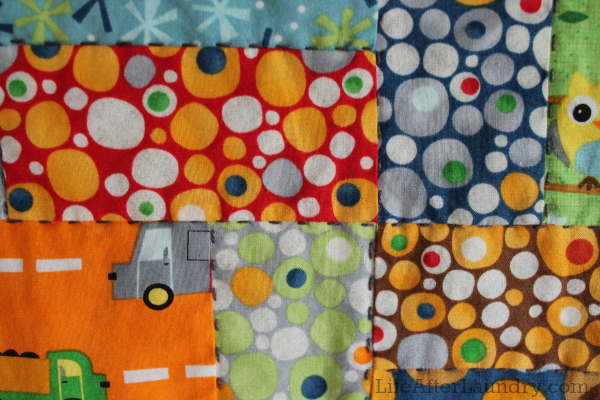 I really want to make a quilt but I’ll be trying it with a machine first! Good job! Thanks, Catherine. It took 8 months, but that is because I would get frustrated and not work on it for weeks before getting the nerve back up to start on it again. I was too chicken to do it on the machine, but I’m going to force myself to learn. I can’t take that long every time I want to do a quilt. Beautiful! My husband collects antique quilts and they are all hand quilted. He says that is part of the charm but today their are machines that quilt that look like the fabric is hand quilted. Your quilt is beautiful and you should be so proud of it! He is right. Hand quilting always catches my attention because it is part of the charm. Yes, they do have those kind of machines now, so you can cheat. I guess my mistakes are what would clearly let someone know it was really by hand. It is wonderful. I am SO proud of you and happy that you have the courage to begin and follow through on such a project. I just adore the little owls. The colors, the stitching and borders all goes together so well. Is the quilt on little man’s bed? Thank you so much, Brenda. It is such a relief to have it done. Yes, it is on his bed. Girl… You did an amazing job! I’m so proud 🙂 So beautiful! Props to you for doing the entire quilt by hand! Thank you! It was hard work, but very worth it. We went to a quilt show the other day and someone asked Eli what his favorite quilt was, he said my quilt and I just smiled. This is a cute quilt, I wish that I knew how to sew these. I would be glad to help if you ever wanted to try, Christy. Wow Brenna that is beautiful! I love the quilt and am so in awe of you for doing it by hand! Thank you so much, Tammy. Love this quilt! It’s just beautiful. Brenna! This is beautiful and amazing! Seriously! I love it and you are so talented! And I love the fabric choices! Katelyn recently posted…HUGE Facebook Fan Giveaway! Thank you so much Katelyn, and I will put it on my list to fix tomorrow.